Although evolution has left dragonflies virtually unchanged for roughly 300 million years, new research by a UTM biologist reveals that understanding small physiological activities in these insects could reveal a deeper understanding of how they interact with other organisms in an ecosystem. "We often think communities are so complex," says Shannon McCauley, an assistant professor of biology at U of T Mississauga. "It looks like the underlying physiological mechanisms could simplify our understanding of ecological dynamics." Dragonflies are common near lakes, streams and ponds where they catch insects like mosquitoes, moths and midges. Although they seek cover in plants and have large eyes with nearly 360° vision, they can become prey for birds, fish, spiders, frogs and even other dragonflies. After hatching from an egg, dragonflies live in water as aquatic nymphs, feeding on aquatic insects, tadpoles and even small fish. 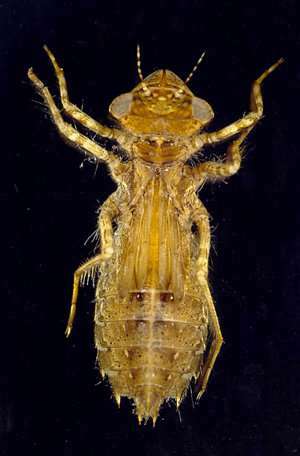 In this paper, published in the latest issue of the Proceedings of the National Academy of Sciences, McCauley and her colleagues, Denon Start and Ben Gilbert, studied 17 species of nymph-stage dragonflies in ponds in and around the Koffler Scientific Reserve, located roughly 60 kilometres north of the downtown U of T campus. Some ponds had large fish and some did not. They found that in ponds without large fish, they were more likely to find dragonfly nymphs with high activity rates but lower "burst speeds"—a capability to swim explosively away from a potential predator. Alternately, in ponds with large fish, dragonfly nymphs with low activity rates but high burst speeds were more common. But this team—comprised of colleagues from U of T's Department of Ecology & Evolutionary Biology—took this a step further. They were able to link high levels of an enzyme called Ldh to high activity rates and high levels of the enzyme Ak to fast burst speeds. 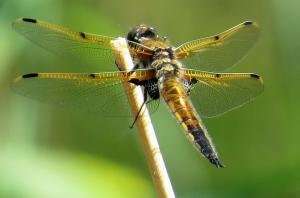 In fact, her team found that the activity of these two enzymes accounted for more than 80 per cent of the variation in dragonfly community composition. "It's a further step down the scale of biology," says McCauley. "It suggests that we can look at these low levels of biological coordination and make predictions about communities."